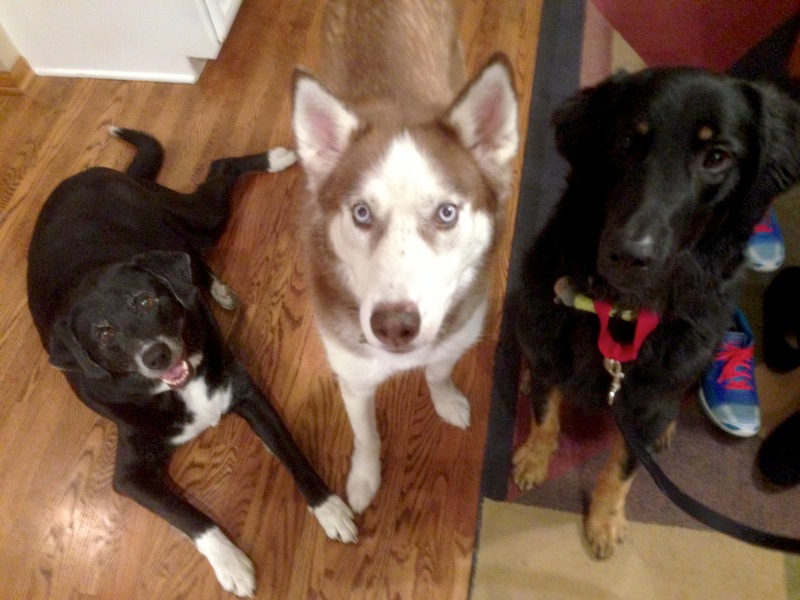 For this session I worked with Emmit (left) Kodi (Center) and Hank (right) who’s rowdy behavior had gotten out of hand. Without going into too many details, lets just say this is the first time I have worked with a dog who has started a fire and flooded a house with his mischief. I could instantly see that there was a leader follower issue by how the dogs interacted with the members of the family. The jumped up on, clawed at or nudged their guardians for attention and to make matters worse, the humans responded by instinctively petting them. Even after I pointed this out, some of the members of the family couldn’t stop themselves from petting the dogs. Any time you have dogs that have no boundaries or limits and the guardians pet them on demand, its a recipe for disaster. I strongly suggested that in the future they only pet the dogs for a reason. Instead of following their order to pet them, the next time the human should counter with a order of the own (sit or lay down). Once the dog complies, petting it while repeating the command word for that action will help condition the dog to assume that posture to ask for attention rather than pawing or scratching for it. Next I showed the humans a few non-verbal ways to communicate and disagree with the dogs when they did something they didn’t want. Because dogs play by pushing and shoving one another, its never a good idea to push a dog away as it can send a confusing message (i want to play vs I want some space). One of the issues was the dog’s getting into the trash.The family had solved this issue by moving the trash can into the garage. While this prevents the dog from getting into the trash, it doesn’t teach them to stop doing so. To accomplish this I had them bring the trash can into the living room. 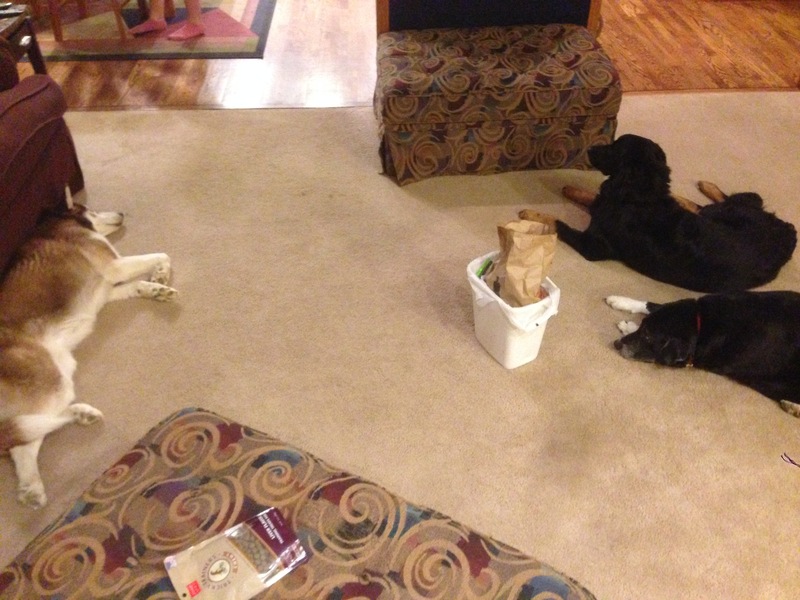 I had them place it in the middle of the floor then use the new non verbal communication methods to tell the dogs that they were to leave the trash can alone. It only took a few corrections before the dogs moved away and laid down. Now this exercise will need to be repeated under a watchful eye. If left alone at this stage, its a safe beet he dogs will get into the trash. But by practicing having the trash so readily available and disagreeing when they show interest, they will be able to teach the dogs to leave it alone. 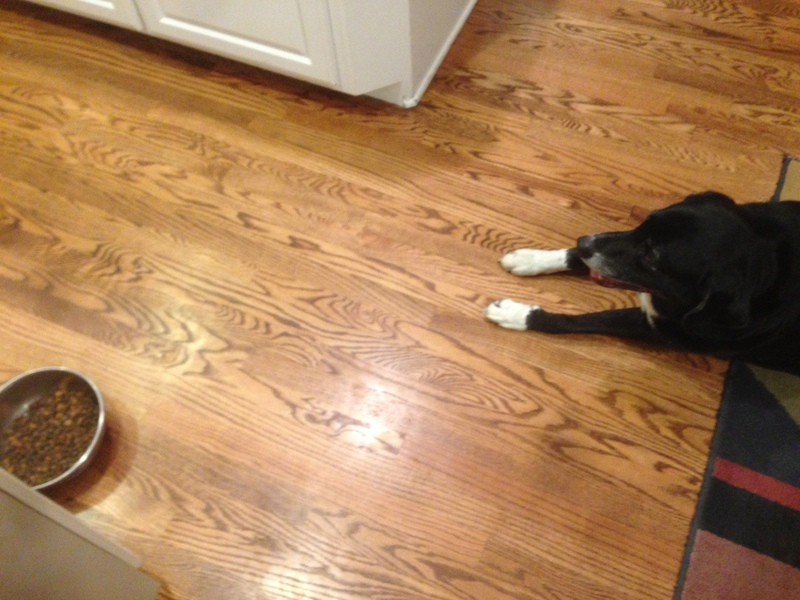 One of the dog’s primary issues was a lack of impulse control. To help remedy that, I showed their guardians a number of exercises that will help the dog’s learn to self restrain and look to them for guidance. One of these exercises was adding structure to meal time. Emmit was the worst violator so I showed his guardians how to communicate that he was to stay away from his full food bowl until given permission to eat. To be close enough to see the food but not be able to eat it is quite a challenge for many dogs. It most certainly was the case for Emmit. He tried to go through his guardians but they blocked him. Next he tried to go around the work island, but they blocked him there as well. After a few additional corrections, Emmit laid down a few feet away from the bowl and waited until given permission to eat. Because their guardians have let the dogs get away with a lot of unwanted behaviors for a long time, its going to take a few weeks of consistent corrections and good leadership to change the dog’s behavior for good. But by the end of the session, the dogs were responding better to commands and corrections. With some patience, timely corrections and proper reinforcement, this pack of dogs will learn to adopt the behavior expected by their family. Once that is the case, they can go back to petting them as often as they wish.